Throughout North America there are several iconic stretches of road, and the Sea to Sky Highway from Vancouver to Whistler is arguably one of the most notable. Officially known as Highway 99 and constructed originally in the 1940’s, the highway has seen numerous changes and upgrades. As part of Vancouver’s bid for the 2010 Olympic Winter Games, the government of British Columbia authorised an upgrade to the highway to accomodate larger traffic loads. It was widened to a double lane highway in both directions, and to further increase safety a concrete median was added to provide a structural barrier between the lanes. 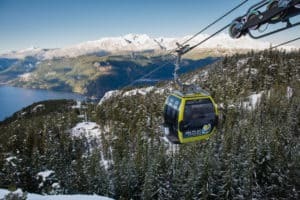 The Sea to Sky Highway now hosts millions of visitors and commuters travelling the breathtaking coastline of Howe Sound, through the communities of Whistler, Squamish, Britannia Beach and Lions Bay. How long is the Sea to Sky Highway? The total length from the U.S. border is about 409 kilometres (254 miles).